Single-protein diets offer relief for many cats with food allergies. As allergy sufferers, we humans are not alone. An increasing number of our feline friends are being diagnosed with allergies, too. If stubborn itchiness or gastrointestinal upset is making your cat’s life miserable, her food may be the irritating culprit. Your veterinarian may recommend trying something new on the menu. While your allergies elicit sneezing and sniffling, a cat’s allergy symptoms typically include skin irritations, which prompt licking, chewing and scratching. Some cats may suffer ear infections or exhibit gastrointestinal signs such as recurring vomiting or diarrhea. Your cat’s system may be setting off an inflammatory reaction to protest an ingredient in her diet. This can occur at any age, regardless of how long she has been dining on her food without an issue. Diagnosis is based on a process of exclusion as a diet of new and limited ingredients is fed on a trial basis. Proteins are the most frequent component of commercial cat foods to incite a food allergy. Certain carbohydrates such as wheat are also potential allergens. Because the most commonly used protein sources in cat foods are chicken, fish and beef, your veterinarian will likely recommend a food with limited ingredients that includes a novel protein. Therapeutic diets used to control allergies contain a single-protein source that your kitty has not sampled before such as lamb, duck, rabbit or venison, as well as a novel carbohydrate source such as peas or potatoes. Your cat must eat the new single-protein food exclusively for several weeks. By slipping your kitty her usual treats, table handouts or giving in when she complains about the new menu, the hypoallergenic diet will not work because her system is still being exposed to potential allergens. 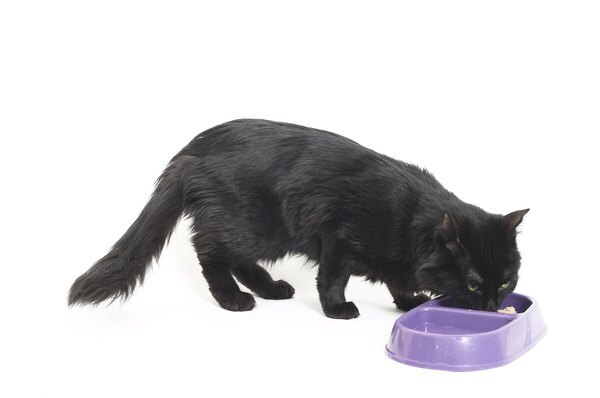 If at the end of the controlled feeding trial you note improvement in your cat’s condition, your veterinarian may ask that you resume her former diet for a couple of weeks. If her symptoms return, then a food allergy diagnosis is conclusive and she will be placed on the single-protein diet permanently. Single-protein diets from various pet nutrition companies may be obtained as a prescription through your veterinarian, or he may offer you enticing recipes for meals and treats to cook at home. Some pet food companies also have formulated similar diets that are available in pet supply stores. Once the offending allergen has been eliminated from your kitty’s dish, her allergies will be controlled and she can enjoy itch-free bliss once again. Does It Work to Punish a Cat? What Can Happen When a Stray Cat Scratches You? What Are the Causes of Premature Kittens?